Managing medical and hazardous waste in an environmentally sound and cost-effective manner, Stericycle’s focus has been to keep on top of changing regulations, provide disposal infrastructures, and be a strong partner while putting customers first. Formed at the beginning of the development of the medical waste industry in 1988, Stericycle (Lake Forest, IL) was founded in 1989 as a company to help manage medical and hazardous waste in an environmentally sound and cost-effective manner. In the last 30 years, Stericycle has grown their offerings to provide safety and compliance training services, starting with the launch of the Sterisafe and compliance program in 1999. In 2003 with the creation of EnBiowaste Systems, the company’s pharmaceutical waste program, a way was provided to dispose of expired and unused waste in hospitals, healthcare practices and retail pharmacies. Stericycle also helps hospitals manage their waste streams and dry recycling efforts. In 2009, Stericycle started to offer integrated waste stream solutions and in 2010, they started outpatient notification services with their communication solutions group. They also acquired a company called Notify-NV and made some additional acquisitions that gave them telephone support services in physicians’ and doctors’ offices. In 2014, Stericycle acquired PSC Environmental Services, which formed the start of Stericycle Environmental solutions, managing and helping companies with their hazardous waste needs. Finally, in 2015, they acquired Shred-It, a company shredding and disposing of important documents in a secure manner. All of Stericycle’s services and portfolios tie in with each other nicely for highly regulated industries with compliance solutions. As a global-wide company, Stericycle provides services in 21 countries, and has a network of more than 1 million healthcare professionals and 24,000 employees worldwide. They have managed the safe disposal of 1 billion pounds of hazardous waste, 70 million pounds of pharmaceutical waste and 1.7 billion pounds of medical waste. In addition, 740,000 pounds of paper have been securely shredded and 162 million pounds have been diverted from the landfill. 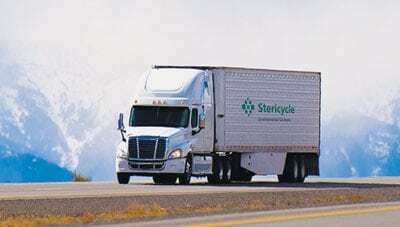 A Stericycle truck travels cross-country to support customer’s hazardous waste management needs. In order to keep up with changing regulations, special corporate and national teams are fully focused on compliance. Experts in their field, they are assigned by regions and spend quite a bit of time with regulators, whether they are in states that are highly regulated, like California, or others. They are also out with Stericycle’s customer base on a regular basis talking about new trends and understanding what the regulations are, EPA standards, and what states are looking at as far as adoption. “These Subject Matter Experts at Stericycle make up our compliance support structure,” explains Ellis. “They have an important responsibility, with some experts focused on health and safety, field compliance, EPA and other waste regulations, and those in regulatory affairs who are talking to lobbyists in Washington integral to making decisions.” Stericycle is currently looking at detailed state inspections and leveraging hazardous waste regulations to locally work with what companies are doing a little more closely, including regulatory activity. 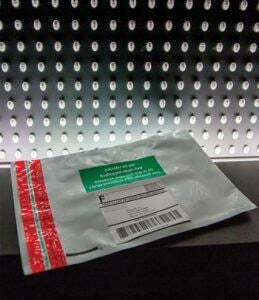 A Stericycle Takeback envelope is displayed at the National Safety Council’s traveling exhibit, “Prescribed to Death: A Memorial to the Victims of the Opioid Crisis” in Chicago in November 2017. These envelopes are used as a way for consumers to return unwanted or unused prescription drugs. Once the waste is collected, Stericycle works with each individual company to help them meet their goals of how they want that waste disposed of in the most cost-effective and compliant manner. With multiple options globally available for the end disposal of these waste streams, Stericycle is able to offer their industry expertise and find the best solutions for each customer, depending on the mix of their waste, the rotation and other factors. “We craft custom solutions for each customer,” stresses Ellis. Hazardous waste must be packaged and transported in accordance with strict procedures and guidelines, while disposal must be coordinated and managed in properly permitted Treatment, Storage and Disposal Facilities (TSDF). Stericycle Environmental Solutions’ combination of specialized personnel, processes, and equipment is designed to safely transport and dispose of virtually any waste type, in any quantity. Highly trained technicians and a fleet of more than 500 specially-equipped vehicles provide customers with safe, compliant and cost-effective waste transportation. 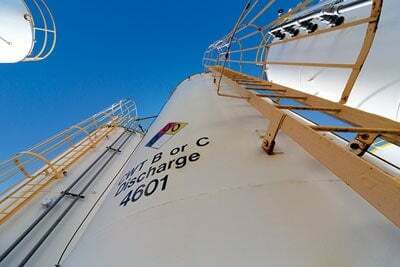 A total of 13 RCRA Part B permitted Treatment, Storage and Disposal Facilities and more than 30 permitted 10-day transfer stations deliver the most appropriate hazardous waste disposal method for any given client, while meeting all regulatory and sustainability goals. During the hazardous waste process, the customer packages the waste or Stericycle Technicians can come onsite and preform the service of packaging the waste. The term “lab pack” is used in the hazardous waste industry to describe the process of SRCL sending out technicians into a customer location to segregate and package all types of small container of hazardous waste (like chemicals from a university chemistry lab) into the appropriate containers for shipping. SRCL preforms lab packing services for universities, hospitals, schools, HHW collection events, etc. SRCL technicians mark and label the packages and produce the proper hazardous waste manifests and shipping document so to maintain EPA and DOT compliance. SRCL trucks transport the waste to Stericycle’s TSDFs and either treat the waste at the TSDF or consolidate the waste for efficient transportation to final disposal facilities. SRCL manages the production of all compliance paperwork, including hazardous waste manifests, Land Disposal Restriction Forms (LDRs) Bills of Ladings (BOLs). Disposal methods for hazardous wastes include fuels blending for flammable liquids, chemical stabilization for wastes with heavy metals, chemical neutralization and waste water treatment for corrosives, hazardous waste incineration for toxics, and recycling for universal waste like batteries and bulbs. ESOL has 13 RCRA Part-B Permitted hazardous waste TSDFs, but Stericycle has access to third party treatment and disposal facilities that can manage any hazardous waste stream. With medical waste, the customer packages the waste into medical waste containers, a Stericycle driver arrives and loads the packages onto Stericycle trucks, produces the necessary transportation shipping documents and transports the packages to Stericycle facility for treatment. Autoclaved material and incinerator ash is hauled to the landfill. Medical waste streams (sharps, medical waste, trace chemotherapy) are all managed at Stericycle facilities. Most medical waste is autoclaved (high heat, steam, and high-pressure treatment to kill any potentially infectious component) followed by landfill. Trace chemotherapy waste is incinerated. Stericycle has a network of both autoclaves and medical waste incinerators. Hazardous waste is stored in tanks. Stericycle is very involved in the respective communities that they serve. Shred-It holds information destruction days where they allow local residents to bring their home documents to a designated site to shred securely. The company recently partnered with the National Safety Council to develop a traveling exhibition that brings awareness to the opioid epidemic. Stericycle also donated medical disposal envelopes that visitors could pick up when they came to view the exhibit. “It was a fantastic event and, ultimately, it ended up on the White House lawn in Washington, DC from April 12 – 18, 2018 where the first lady visited it and several of the Trump Administration officials spoke at the event. It was a very exciting opportunity to be a part of bringing awareness to the opioid epidemic,” says Ellis. Stericycle was also involved in the Hurricane Harvey and Hurricane Maria cleanup in 2017, partnering with several of their customers in an effort to collect hazardous waste after the disasters. Typically, since there is a lot of flooding and damage, loose pharmaceuticals may end up floating in the water and this hazardous waste needs to be safely and compliantly removed. Ellis points out that one of the things that she is most proud of is that many of their legacy employees from PSD Environmental, which is headquartered in Houston, TX, who joined Stericycle family in 2014 and were affected by Hurricane Harvey, benefited from their relief efforts. Not only did Stericycle hold food and clothing donation drives, but a Stericares Campaign was also created where employees were able to donate a portion of their paycheck for the Stericycle families that may have been affected by the disaster. “We amped those efforts up during Harvey,” explains Ellis. “One team member who was displaced was given a stipend to help with the tear out of dry wall at his home and another person was given funds to relocate herself and her son to a hotel for several weeks since she was without power. We were able to pull together as a family and help others during Harvey.” Although it was a couple of weeks before the roads were clear enough to pass, once they were able, they ran the food, clothing drive and Stericycle campaign for six to eight weeks. In addition, the cleanup effort lasted approximately three or four months onsite for Harvey and two months for Hurrican Maria. The company has held some campaigns for the hungry in Chicago and around where Stericycle is headquartered in Lake Forest, IL, and gives back during the holiday season, participating in great charities, such as Operation Santa Clause, Bears for Babies campaign and others. The Indianapolis office participates in the Salvation Army’s Angel Tree Program, which provides children in need with necessities and presents for the holidays. Employees “adopt” an angel, buying the child clothes, blankets and toys. Last December, the staff provided gifts to 158 children. At the corporate level, Stericycle supports a Team Member Hardship Fund to help team members when they are facing the most challenging of times. Furthermore, each of the company’s local facilities and offices are empowered to identify and support their own community service opportunities. Ellis is most proud of the way Stericycle meets challenges head on, developing solutions that may not yet exist for problems that arise in the industry. In September 2015, most of Stericycle’s retail customers who had stores in San Louis Obispo County, CA, were part of a ruling that retailers needed to provide for the safe disposal of consumer medications. The retailers that already partnered with Stericycle, providing hazardous waste services, came to the company and asked for help in forming an infrastructure to do this. In turn, Stericycle developed the birth of their Seal and Send products—the envelopes that consumers use to send back medication. As a product born out of need, Stericycle made sure they came to their customers’ aid when they were dealing with local regulations while still trying to run a successful business. “This has really been the key component to Stericycle’s success. I think that is a great example of our innovations because this product did not exist, then the regulation came out and we built a whole product and infrastructure to dispose of medications around it, so our customers had a solution,” says Ellis. After this, other California counties started ruling that consumers should be able to do this in a manner that would be funded by pharmaceutical companies and now they are responsible for medication take backs from consumers. As a result, Stericycle partnered with pharmaceutical retailers, hospital systems nationwide and consumers to offer an opportunity to get end use medications out of homes. “We are very proud of the fact that we are part of the solution. We are now the #1 company that takes back medication for disposal.” Envelopes go directly to waste disposal facilities, while kiosk waste goes to Stericycle’s Indianapolis facility where it is sorted. From there it is sent to various places for end disposal within customer regulations. In the last few years, Stericycle’s kiosk business to collect consumer medication has been the fastest growing part of their business, as well as developing partnerships with other extended producer responsibility organizations, including the recycling and disposing of paint. For more information, visit https://www.stericycleenvironmental.com/contact-us/.